It is usually left off of world maps, but in this one Antarctica is the guest of honor. Most flat map projections, even if they do include Antarctica portray it as a wide band of white, with little visualization of how it actually appears. Above is a map viewing the spherical Earth from a southerly position, providing the least distortion to Antarctica, but giving a very different view of where South America, South Africa, New Zealand, and Australia lie in relation. 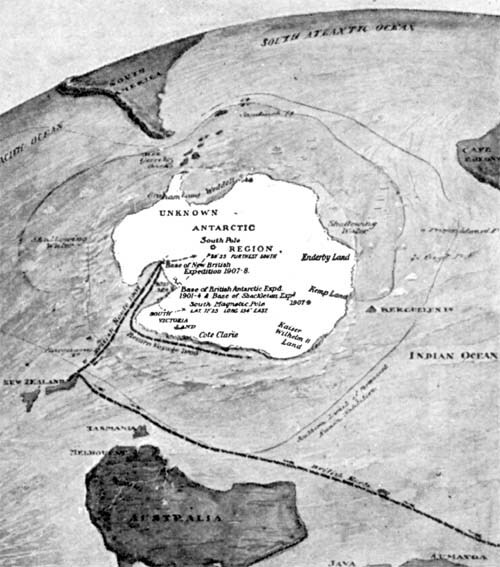 The map’s purpose is to show various expeditions to locate the South Pole; the map was reduced such that the labels are almost unreadable even in the original. From the multivolume The Book of History, 1890s. This entry was posted on Tuesday, November 3rd, 2009 at 8:25 am	and is filed under Uncategorized. You can follow any responses to this entry through the RSS 2.0 feed. You can leave a response, or trackback from your own site. Looks like you could just sail right over to any of the three big continents really easily doesn't it? Thanks for posting this. I've never seen it from that perspective!